I have two interesting things to share with you this week: one is about hedgehogs and the other something new to learn about those pesky dormice that I wrote about in November last. The hedgehog, I learnt, can climb up trees but he cannot climb down. So, when he has climbed to the top of the tree he rolls up into a ball and hurls himself to the ground, suffering no pain whatsoever, then scampers off unhurt. 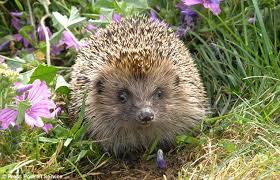 The hedgehog was named because of his peculiar foraging methods as he roots through hedges and undergrowth in search of small creatures that compose the bulk of his diet: insects, worms, centipedes, snails, mice, frogs, and snakes. As he picks his way through the hedges he emits pig-like grunts, hence his name. In the Middle East, and especially among Bedouins, hedgehog meat is considered medicinal and thought to cure arthritis and rheumatism. In the 1980s "hedgehog-flavour" crisps were introduced in Britain, although the product contained no hedgehog. Anyway, I am sure we all know and love Mrs. Tiggy Winkle and wouldn't want her in a crisp. Now to the dormice. The bridge that had been built for them to travel over, above a by-pass near Pontypridd in Wales, so that they could have a more enjoyable social life with the dormice on the other side of the road, without being killed in the process, was blown over by strong winds in February and still hasn't been put back up. This structure cost £190,000 and, in my opinion, was not money well spent, but the dormice probably wouldn't agree and are missing the freedom to frolic and socialize with dormice from the 'other side'. And we are smiling back. Thank you Patricia. One of the pleasures of Charlbury life is that so many people exchange a smile. There are those who don't, and they look unhappy.